here's the latest in my series of disney posters for mondotees, a 4-color silkscreen poster for "mickey's service station". this short represents the first team-up of mickey mouse, donald duck and goofy and is also the last black and white short to feature mickey mouse. the posters drops on friday, may 27 at a random time. see below for details. 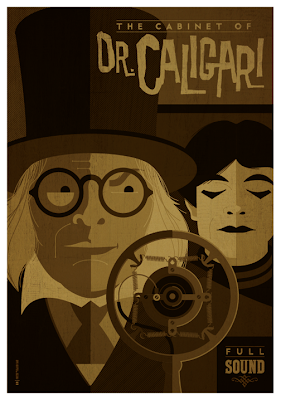 november fire recently hired me to illustrate a dvd cover for their upcoming release of "the cabinet of dr. caligari". the disc will feature the classic silent expressionist horror film overlaid with a sinister soundtrack by hobgoblin. i have to admit that my knowledge of "caligari" was limited (at best) when i began this project, but while doing my research i learned just how influential this film was to the horror films that followed it, especially the universal monster movies. keep an eye on the november fire site for official release info. 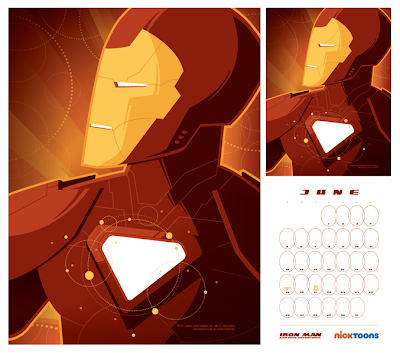 one of my favorite pages in the entire nicktoons calendar, here's the season 2 armor from "iron man: armored adventures"! i haven't seen much of "armored adventures", but i've generally liked what i have seen... and it's always cool when you get a chance to draw any of tony's armors. after designing this gig poster for chris hardwick, (comedian/actor/host of the insanely popular nerdist podcast, penguin books hired me to adapt it for the cover of chris' new nerd self help book "the nerdist way". even though they had me take this image through to final, they eventually decided to go with a photo cover for the book. at any rate, it was a fun assignment to work on, i got paid for it, and i got to draw a giant tin robot. not too shabby. 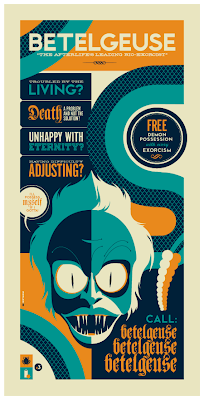 here's my contribution for the 3B show (which opens tonight at gallery 1988: venice) , "betelgeuse: the afterlife's leading bio-exorcist". the show is curated by chogrin and features autumn society members' tributes to beetlejuice, back to the future and bill and ted. 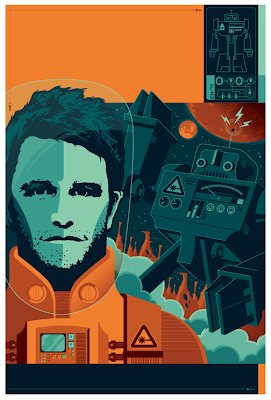 the show is a sequel to last fall's 3G show. 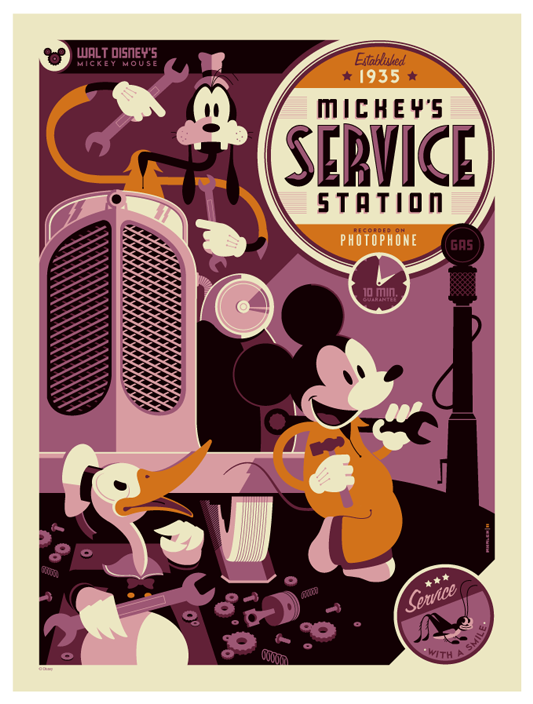 for this go-round, partners in crime montygog, nakedderby and i (jointly known as the STD collective; *snicker*) chose to silkscreen a series of three posters (one by each of us) celebrating an advertisement from each movie. i went for beetlejuice's yellow pages ad, montygog (a.k.a. dave perillo) created a gig poster for the the battle of the bands from bill and ted's bogus journey and nakedderby (a.k.a. scott derby) fashioned an event poster for back to the future's "enchantment under the sea" dance. we kept color scheme, border depth and signing protocol identical, so they really hang together as a set. if you're in LA tonite, make sure to check out the show...there are a ton of talented artist contributing to this event! prints will be available at the show. any left after the opening will be available online here within a day or two. 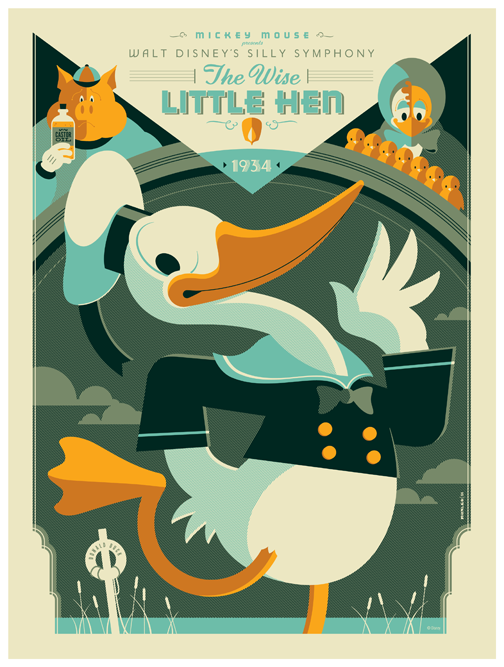 here's my latest project for mondotees, a 5-color silkscreen celebrating the first appearance of donald duck in "the wise little hen"! i've been really, really excited to show this one off. watching these old shorts (in the name of research) with my son has been incredible. the fact that he responds to them the way that he does speaks to their long-lasting quality. i am consistently amazed by the craftsmanship of early disney animation and love that he and i can share these amazing cartoons together. even though donald is a major character in "the wise little hen", he's hardly the star. we chose, however to spotlight him on this poster because of the timeless character that he'd become in so many disney productions that followed this one. this is a (long overdue) trade that i just completed for the incredible sillof. his unbelievable customs have wowed me for quite a while, so when he reached out to me last year asking if i wanted to trade an illustrated poster for one of his custom figures, i jumped on the opportunity. 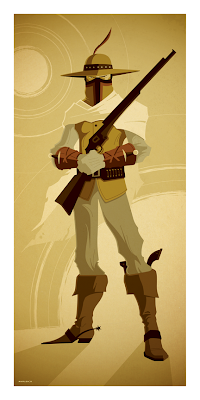 after a year of me dancing around my schedule, i finally pulled myself together and knocked out this illustration of boba fett from his west wars line of customs. in exchange, he created this mindblowingly awesome steampunk optimus prime for me. sillof has such a great knack for taking characters and re-imagining them in different eras and themes. i'm so pumped to have one of his original works gracing my transformers shelf. can't wait to see what he comes up with next!